Anything that comes from my in-laws garden tastes heavenly and is a goodie because it hasn’t been treated with chemicals. Serge was visiting his parents last week and got back with a jar of dried lavender. 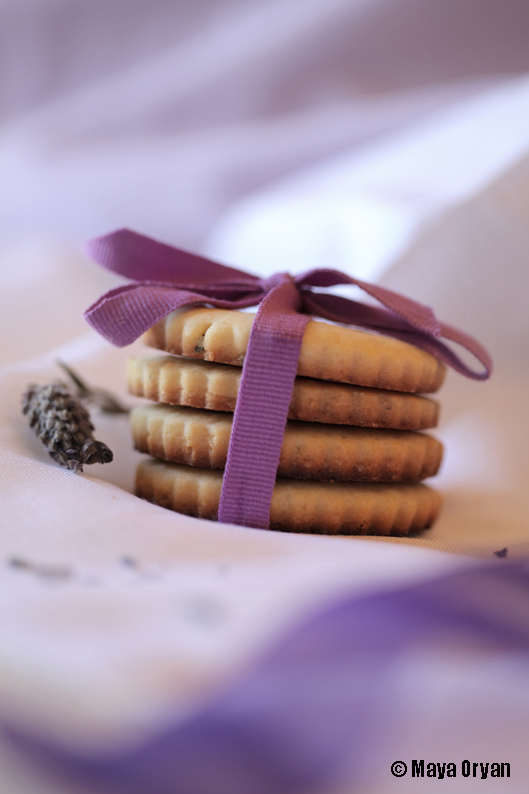 I love lavenders, they look, smell and taste great, especially in cookies. I make this recipe very often during spring. The sweet and fragrant flavor pop in these cookies by just adding a handful of dried lavender to my classic recipe. Everyone adores them! Editor’s note: Your dough should come out firm. If it happens that it’s soft, chill the dough for half an hour before start working with it. Preheat oven to 180°C / 350°F, and place rack in the center of the oven. Line baking trays with parchment paper. In a separate bowl combine flour, baking powder, salt and lavender. Gradually add to creamed mixture and mix until thoroughly combined. On a lightly floured surface, roll out each ball to an approximate thickness of 1/4 inch (6 mm). Dip cookie cutter in flour before cutting out shapes and transfer to baking sheet. Let cool for 5 minutes then transfer to a wire rack to cool completely. Garnish with additional lavender flowers if desired. This entry was posted in Desserts, Recipes and tagged basic cookies, butter cookies, dried culinary lavender, dried lavender flowers, food styist, Food Styling, food stylist lebanon, lavender, Lavender Cookies, lebanese food blogger, Lebanese food stylist, Maya Oryan, Mayas Ingredients by Maya Oryan. Bookmark the permalink. Yummy! Love the smell of lavender… but where can I get lavender in Dubai?! Such a simple recipe and so pretty to look at. I love the grosgrain ribbon! How lovely- These sound so delicate and dainty, perfect to pair with a cup of tea. Beautiful pic, wonderful cookies :-). Thank you, they smell and taste wonderful!